I had the distinct pleasure of watching the Jazz game via my parent's bedroom tonight. The family room had been taken over by an army of teenage boys (some who call me Aunt) of sharp wit and unfailing energy. My parents and I fled the scene as we were no match for such a crowd. As the game progressed we found ourselves also becoming involved--during commercial breaks--with a Vh1 documentary about feminism. I am so confused about my identity with the whole movement which started decades ago and still wages on today. Most of the time I feel that I am the anti Feminist-of-Today, she who yearns to not just be equal to man, but be man. But I like the feminist who cheers on the causes of free-spirited women. Women who can make their own life choices based on intuition and female divinity. 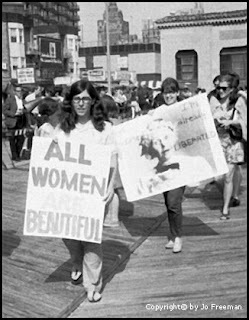 There was a segment in the documentary where the feminists of the sixties talked about how they decided to protest the Miss America pageant. The film split scenes from energetic women burning their bras outside the convention center to polite women walking down the Miss America stage in their evening gowns. Women holding "sisterhood power!" signs. Women holding bouquets of roses. Back-and-forth. I looked at my parents. They were engrossed. "Which one would you rather have your daughter doing, the protesting or the pageantry?" I asked very intrigued. They slowly peeled their eyes from the tv to my direction. "The pageant. Of course." My dad said. "The protest." Replied my mom. Then when the game became too intense for my mother to watch she left the room. My dad and I were alone flipping between the channels. "Did you really mean the pageant? You know that in real life, your daughter would probably be doing the protesting. Not to be mean, just to be different. You raised me that way." "No, really, I'd want you to be in the pageant." I exhaled. Was my dad losing his edge? I had a feeling that he'd always quietly championed my causes for the contrary. In the last seconds of the game, as the Jazz were trying to pull out a win, I caught on to my dad's maneuvering. He could never admit that he liked his daughter to be The Protester. Doing so would extinguish the flame that he had worked so hard to stoke. His game: Hide the Pride.